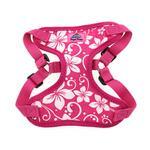 Now you can feel like you're on an island vacation with the Wrap and Snap Choke-Free Dog Harness in Pink Hibiscus! Embrace a beautiful and relaxed tropical lifestyle with this easy-to-use Wrap and Snap Choke-Free Dog Harness. The Wrap and Snap Harnesses by Doggie Design are easy to use, lightweight, soft and feature dynamic colors and prints. You'll love how fresh this Pink floral print looks on your little pup. It's a ready-to-wear style that is comfortable and durable. There are double D-rings for leash attachment for added security. May we suggest one of our Barking Basics Leashes to complete your look? Made of 40% cotton and 60% polyester. Hand wash separately, line dry. 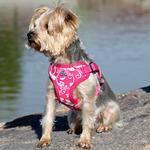 Look for our solid mesh and other designer print Wrap and Snap Choke-Free Dog Harnesses, sold separately! Wrap and Snap Choke Free Dog Harness by Doggie Design - Pink Hibiscus Customer Photos - Send us your photo! This is Sandy, she is between 3 and 4 years old and we have had her for nearly 4 weeks. We rescued her from the local shelter where she lived for nearly a year after being rescued from a hoarding situation with 21 other dogs. She is a Cocker Spaniel mix, has had a least one litter of puppies and is very sweet. She has no training, but is housebroken and walks beautifullyl on a leash. She has been spayed and had captured the hearts of everyone at our Veterinarian’s office, where she has been given a clean bill of health. We look forward to training her and giving her the loving home she has not known before. Posted On 11/15/18 by MJ from , Yes, MJ recommends this product! This was the perfect harness for summer! Posted On 07/27/18 by MJ from , IL Yes, MJ recommends this product! My pup has almost every design in these 'wrap and snap' harnesses, we love them! Posted On 08/23/17 by Amanda H from Baltimore, MD Yes, Amanda H recommends this product! The harness is padded & cushioned, so when my dog starts to pull she doesn't choke. The pink color is spot on & the design is so pretty! This product is made from great material. Posted On 06/11/17 by Mary B from Los Angeles, CA Yes, Mary B recommends this product! This is a cute and study harness. It does make clicking noise because of the plastic buckle and metal harness rings. Posted On 04/25/17 by Juanita L from Kenilworth, UT Yes, Juanita L recommends this product! Was a little too big for my Mini dog, so will save it see if she fits into it. love the products and ease of purchase. my dogs are certified therapy dogs and wear the scrunchy collars on hospital visits. they make the patients smile!